The image above: Canada declared war on August 5th 1914. 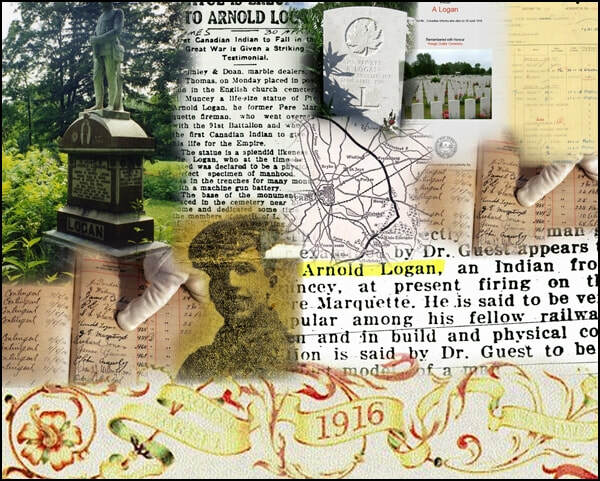 The Register of the Elgin Regiment reveals that Arnold Logan volunteered for service on August 11th. 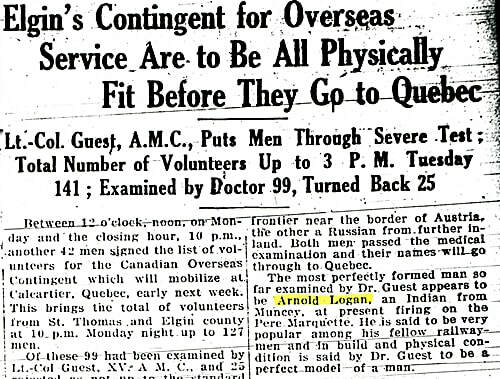 By the 22nd he was on his way to Val Cartier, Quebec as a member of the 91st Battalion and the First Contingent of the Canadian Expeditionary Force. Two years later he was dead. Snippets of a life lived in barely twenty years reveal a man who knew how to be a good and loyal friend and was sorely missed by all who knew him. Unfortunately, family photos were lost to a fire so these faded clippings are all that remain. These clippings, and his place in history as the first First Nations man to be killed in action during the Great War - April 26, 1916. "a perfect model of a man". Before enlisting to go overseas, the young man from Muncey and his best friend and fellow railroad employee, Ernest William Biggs, were both members of the 25th Elgin Regiment and the St. Thomas Rifle Association. Biggs' letters home to Captain Miller of the Rifle club reveal a fast friendship - although Biggs was not shy about playing up Arnold's reputation as a perfect model. He writes that he is sending a photo of himself to the Captain but British camera's could not stand the strain of Arnold's perfection. We were both glad to get your letter and we also thank you kindly for the Mexican luck charms you sent us. We have hung them around our necks with our identification discs, we hope that they will turn the German bullets and bayonets. By the time you get this we will be in France on our way to the front, and I tell you we are glad to get out of the mud of the Salisbury Plain. We are driving the ammunition wagon and of course ride the horses. We rode eleven miles last night and every bone in our bodies was sore and stiff. We can hardly walk yet. We have a nice team and carry the ammunition for the machine guns only. We got the Webb equipment in place of the Oliver a few days ago and now look like real soldiers. We also have a good pair of English shoes.